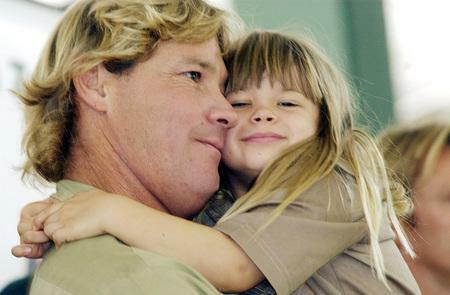 A picture of Steve and Bindi showing their love for each other. Thanks Steve, for inspiring lots of people and making the world a better place. Lots of people think about you! If you were still alive, you would be a great influence to young children and you would probably be rich. Bindi you are also a great influence to younger children and I hope you grow up to be like your dad one day! I hope you read this Bindi Irwin! i'm your #1 fan totally. Bindi is adorable and i love you, and your family. i'm your #1 fan an i want to visit your zoo. need help around the zoo? i'm here. i luv animals too. R.I.P Mate. An absolutely peaceful and beautiful picture!! But then, it makes me so sad... he'll never be forgotten. Neither his work! steve was the most caring person ever if he saw anyone down hee would help!!!!!!! !IM STILL SO SAD HE DISSAPERED!! !i miss you steve! !YOU ROCK!!RIP. CUTE CUTE AND MOR CUTE. No Picture could show how these 2 love each other more than this one. OMG!!! Bindi, if you're reading this,you look soooo very cute!!!!!! awwwww!! you can tell he loved her more than anything in the world!!! I'm very sorry for the loss of your dad sweetheart. I know how it feels. But always remeber that your dad is still with you. For everytime you think of him he is right there in your heart. WE LOVE YOU BINDI. You are my little hero!!!! Amazing- he loved her very much. What a great thing for him to do for her.